Pack your green clothes and silver buckled shoes! Orlando is host to many a St. Patrick’s Day celebration. Whether you’re in the mood to party with all the green-colored beer you can handle, or you’re looking for something on the family-friendly side, we’ve compiled a list of some of the best celebrations in town. For family friendly fun everyone can enjoy, why not check out Winter Park’s annual St. Patrick’s Day Parade? Starting at 2 p.m. on Sunday March 3, watch over 75 participants perform to Irish music as they make their way down Park and Lyman Avenue. 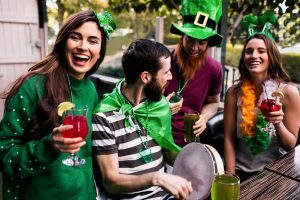 If you are looking for something a little livelier, head on over to one of Orlando’s many Irish pubs. Ragland Road over in Disney Springs is a great destination for authentic food, drink, and live music. Over at City Walk, check out Pat O’Brien’s for dueling pianos and even more live performances. Other parties of note include Wall Street Plaza’s St. Patrick’s Day Block Party and Kitty O’Shea’s celebration. For the more athletically inclined, this is your chance to celebrate with some competitive fun. Head on over to Molly McHugh’s for the 4 Lap Clover 5K, where each lap is completed with a shot of Guinness. With so much to do, it’s important to stay close to all the action. The Clarion Lake Buena Vista Inn’s central location is perfect to explore everything Orlando has to offer. To learn more or book accommodations, give us a call today at 407-996-7236.